What is an A Box you must be asking. It’s one of the perks you get when you buy from me. Doesn’t everyone love a little something extra? Things like free shipping and free products are always a plus. So Avon has come up with the idea of an A Box. Each campaign they present a new one, filled with lots of goodies. This is the time to find your A Box and what you would like. Sometimes they are filled with full size products and sometimes they have a try-it size. There are usually 4 items in a box and the box is only $10 with any $40 purchase. Dont want to spend $40? Get a friend or two to order from the same campaign and then add the A Box for yourself. This campaign the A Box is called Party Perfect Picks and contains full size makeup of an Eyeshadow Quad, a Nail Enamel, a Lipstick and a trial size Vitamin C Brightening Serum…..a $31 value for only $10. This entry was posted on December 21, 2018, in family and tagged #AvonByAgnes, #AvonRep, makeup. The thing about beauty is it’s fleeting. We start out as a cute baby (most of us anyway) and grow into a cute toddler, and then by the teenage years we are experimenting with beauty and colors and accessories. Our 20s and 30s find us trying to stay in those decades because inevitably we find ourselves pushing 40….and by 50 we are wondering what happened. Some of us accept what we are and look like, content in that fact that at our age who are we kidding. We would need a lot more makeup to get back to looking like 20. Or you can go the other way, surgery is always a option, although I am not one to go that way. And so we find what we were doing for our skin in our 20s has a way of catching up to us. But if you turn on the TV today, you will find all kinds of skin care products telling us they will get rid of those wrinkles, make your lips fuller, lashes longer and skin smoother. But are you willing to send hundreds of dollars to do that? I always believed that starting to take care of our skin in our 20s affords us the best possible skin later in our lives. I have always wanted longer lashes. The boys in my family have such long and full lashes….while us gals are piling on the mascara. Or maybe putting on some fake eyelashes. Or permanent eyelashes. Well, no more – because I have found UNLIMITED LASHES… In just weeks your lashes look longer, fuller and healthier. Avon’s unique serum, with a peptide blend and botanicals, is designed to dramatically enhance the look of your lashes….so you never have to FAKE it. This entry was posted on August 8, 2018, in Avon and tagged #Anew, #Avon, #AvonByAgnes, #AvonRep, #free, makeup. How many makeup brushes do you own? I am always amazed at the amount of brushes we need just to do our makeup. Eyeshadow, eyeliner, foundation, powder, concealer, blush, and brow to name a few. It makes sense not to use the same one for everything, and if your brushes are of good quality then it is not something you will have to change often. Plus if you maintain them they can last a long time. I have found these brushes to be the very best and at a reasonable price so even if you have to change them, it won’t cost an arm and a leg…do you need a brush change? This entry was posted on February 10, 2018, in Avon and tagged #AvonByAgnes, #AvonRep, #bbloggers, makeup. Do you match or mix? I have a new habit. I watch every woman I see to see if they have matching lipstick and nail polish on. I for one, do not do that…wait, maybe I do…..I tend to go with pink nail polish and lately have been wearing a light pink lipstick, although some times I go a bit toward the beiges. But since I take notice of these things, I am finding woman who use those mauve colors and wear it both on their lips and nails. How about the darker lipsticks – those berry and wine colors…..and then you match it to your nail polish. Actually I think it is a nice look, very elegant and put together. Do you match your lipstick and nail polish??? When I was young I wasn’t allowed to wear lipstick much less any other makeup. I guess way back then you were considered a “loose” girl if you did. So as a good daughter I listened and didn’t wear anything. But alas I changed parochial school for a public one and yes, many girls wore makeup….but of course I couldn’t tell if they were loose or not. So I stuck by what Mom said. And then I graduated high school. Those days (oops dating myself) college was not only not necessary but it was something girls just didnt attend. So off to work it was. A city job as a secretary – Civil Service Job I think they called it then. I loved working and meeting new people….and then met a girl who said “Why don’t you wear makeup”? And then it started. She introduced me to foundation, mascara, eyeliner and my favorite, lipstick. Don’t leave home without it. 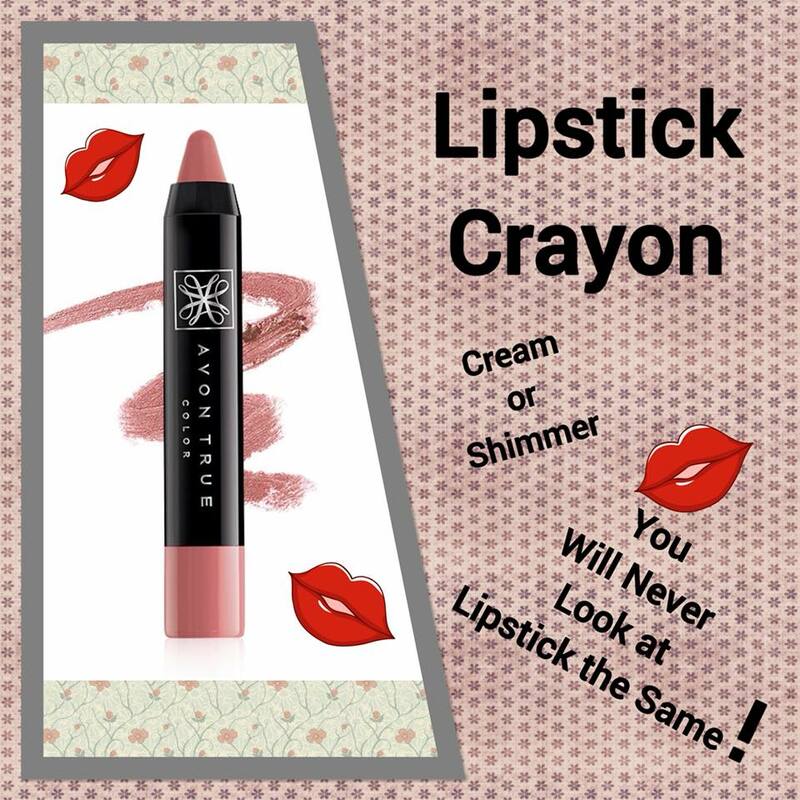 Recently I have been trying out a Lipstick Crayon which I really love. This entry was posted on December 27, 2017, in Avon and tagged #AvonByAgnes, #AvonRep, #bbloggers, #mascara, Avon, makeup. A whole new line at Avon right now is Mark Beauty Shop – all your makeup needs in a few pages of our brochure. Today’s highlight is Get A Grip Eye Primer – apply this oil-free, lightweight cream formula before eyeshadow to help color last without creasing. Also use it to help conceal puffiness. This entry was posted on December 14, 2017, in Avon and tagged #Avon, #AvonByAgnes, #AvonRep, #bbloggers, makeup. The best 12 days of deals has been going on now every day so you can get free products. Personally I think this one is the best one ever. This beauty set contains a makeup bag, along with eyeliner and mascara….when was the last time you can try an eyeliner and mascara free. I know I keep changing my mascara and eyeliner because I like to try new ones to see which is the best for me. But it does get expensive – and I also do it so I can personally tell my customers about the product. But here is a set you try and it wont cost you anything for the makeup – and even if you dont want or like the makeup – you did not lose anything. Dont use makeup? 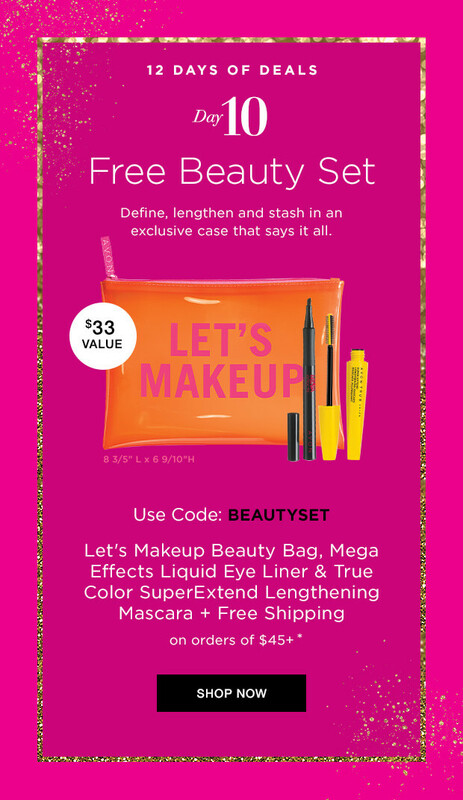 Give it away and keep the makeup bag for yourself…or give that away also – nice stocking stuffer! This entry was posted on December 10, 2017, in Avon and tagged #Avon, #AvonByAgnes, #AvonRep, #bbloggers, #mascara, makeup.